Mark your calendars! We are delighted to announce our Fall 2013 Program: A presentation on African Textiles at the High Museum with highlights from the High’s recent exhibition: Symmetry/Asymmetry: African Textiles, Dress and Adornment. Our presenters will be Carol Thompson, Curator of African Art at the High, as well as Michael Mack, an independent collector of African art. DATE/TIME: Tuesday, October 29, 2013, from 10am to noon. LOCATION: High Museum of Art, 1280 Peachtree Street, N.E., Atlanta, 30309. We will meet in the main lobby, Wieland Pavilion. COST: The program is free to TASA members. Guests: $10 (this covers 2014 TASA membership). We would like to extend a HUGE thank you to Carol Thompson for waiving museum entrance fees. 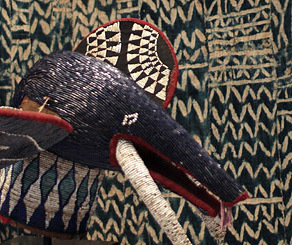 African textiles feature many symmetric patterns. This exhibition evokes conversations between symmetry and asymmetry in designs throughout the continent of Africa and across time. Like rhythmic contrasts in music, the practice of maintaining an overall theme while varying patterns adds an unexpected dimension—an element of surprise—to the creative production. The show calls attention to African textiles as abstract works of art as well, while also suggesting a synaesthetic experience, as these once kinetic works were often created to engage multiple senses. The more than forty works of African textiles, dress, and adornment displayed here include recent acquisitions—gifts and purchases—as well as loans from Atlanta collections.